Another day in Knoxville for me means another guest post for you! Today's post was written by my real-life friend Mary. Not only does Mary write the blog Oven Proof, but she also happens to be my real-life friend and occasional running buddy. 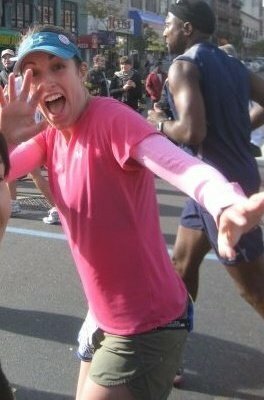 Mary encouraged me to sign up for my first half marathon in 2009 and was ecstatic when I told her about my decision to run my first full marathon last year. So much so that she jumped onto the course when I had less than a mile to go to see how I was holding up. If she has her way, I'll be running at least one marathon per year until my knees give out. Thanks so much for writing, Mary! 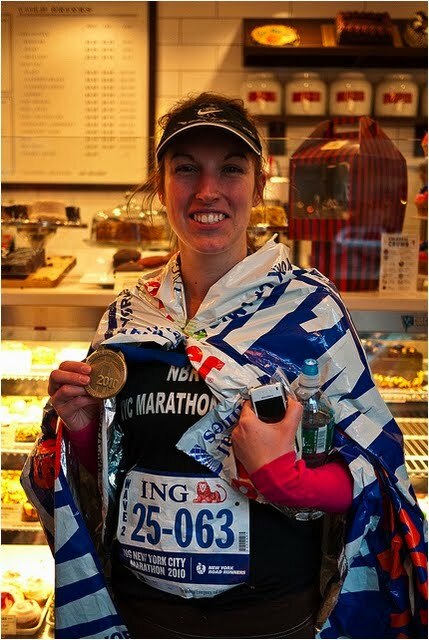 As a runner who loves to bake, I sometimes need to find balance between my favorite activities. No matter how many miles I run, I can't enjoy whipping up and eating a batch of Michelle's famous Montana Whoppers every day! 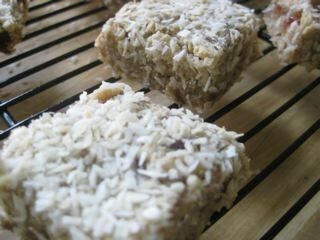 I've found that, while there are a lot of commercial energy bars out there, making your own is a fabulous alternative. I found this recipe and decided to tailor it to be a delicious way to start my day. The recipe already has a good mix of ingredients that will keep a runner fueled and happy through many miles. 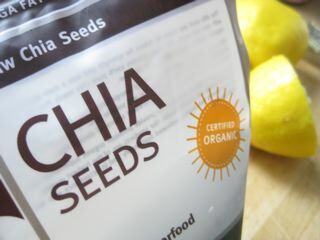 It even includes chia seeds, an ingredient enjoying new-found popularity as a superfood both in pop culture and in my cabinet! 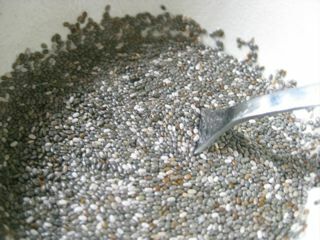 First, the chia seeds are soaked in freshly-squeezed lemon juice. Yes, the very same ones that you spread on your Chia Pet! I added ginger to the recipe for its stomach-calming properties and gentle zing. 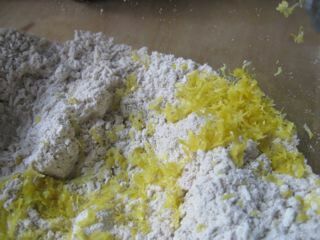 While those are soaking, you can ready the dry ingredients (oat flour, coconut, baking powder, salt and fresh lemon zest) and the wet ingredients. Once the chia seeds have soaked and you've chopped your dates, the two are mixed together, topped with coconut, and baked. Now, you're ready to run! Preheat oven to 300°F. Grease an 8x8 pan. In a large bowl, stir together the oat flour, baking powder, salt and coconut. Stir in the lemon zest. In a separate bowl, stir together the melted coconut oil, applesauce, ginger, and agave nectar. 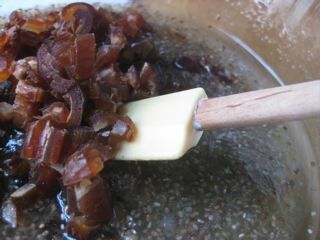 Finely chop the dates and add them, as well as the chia seed mixture, to the wet ingredients. Stir to combine. Add the wet ingredients to the dry, and stir until well combined. Spread evenly into the prepared pan and smooth with a rubber spatula. Top with additional shredded coconut and press gently into the batter. Bake for about 25 minutes, or until slightly brown around the edges. Slice into 16 portions while still warm.